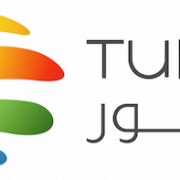 TuNur Ltd has filed a request in the Tunisian Ministry of Energy, Mines and Renewable Energy for the authorization of a 4.5GW solar energy export project destined to fuel Europe. 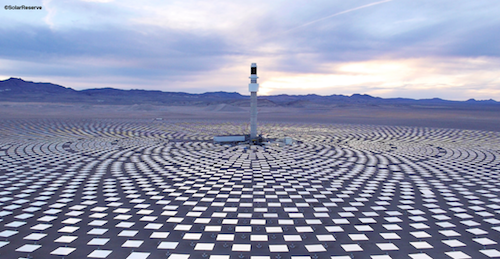 The mega-solar project is envisioned to be located in a newly established solar complex in the Sahara Desert in Southwest Tunisia- a site located close to Réjim Maâtoug in the Kébili Governorate. 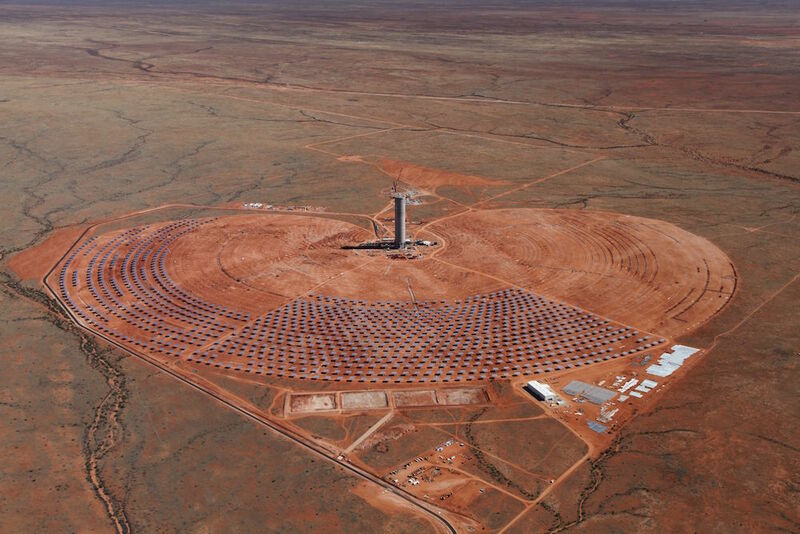 The technology that will be used is Concentrated Solar Power (CSP), using mirrors to heat a tower containing molten salt that in turn heats water to generate steam to run a turbine- a technology that has seen significant cost reductions in the past few years. According to Daniel Rich, the Chief Operating Officer at TuNur, the initial production costs for the first phase will be $85 million, making the cost 10.1 US-cent/kWh – slightly higher than the upcoming solar CSP project that attracted the world’s lowest bid for CSP at 9.45 US-cent/ kWh. Mr Rich said: “Today you have a market in need of low carbon dispatchable power, which has the mechanisms to import power from other countries”. He added: “Next door is a region with extreme solar resource and in need for investment and development. Finally, there are technologies that can satisfy the demand at very competitive pricing and have a very high local impact”. The project is expected to have 4.5GW installed capacity, and will be divided into three phases with three different routes through HVDC submarine cable systems. The first cable will link Tunisia with Malta, at a cost of approximately €1.6 billion and will transfer 250-500MW of solar energy. Malta is already connected to the European mainland with 100 km of undersea power line that transmits electricity to Sicily, Italy- meaning that only the first part of interconnection is needed, i.e. 500 km transmission systems connecting Tunisia to Malta. The second cable will connect Tunisia straight to central Italy, with a shoring point north of Rome. This second route is being studied for years, and is being considered as a Project of Common Interest- i.e, projects that are included in EU’s Energy Union vision and are given development priority and financial support. 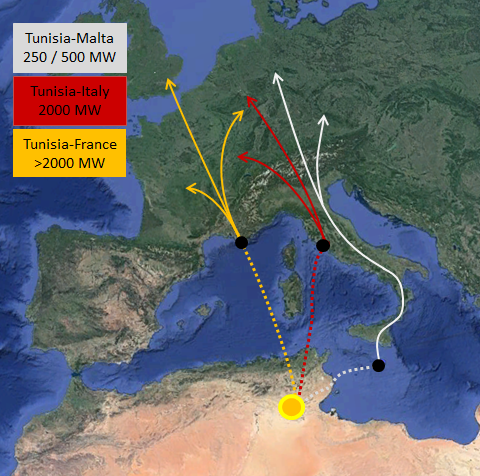 The Tunisia- Italy route is expected to transfer 2000MW of solar energy. A third cable which will link Tunisia to the south of France, possibly to Marseille, is under study, and will possibly transfer slightly under another 2000MW. Kevin Sara, CEO of TuNur underlined that: “ The economics of the projects are compelling: the site in the Sahara receives twice as much solar energy compared to sites in central Europe, thus, for the same investment, we can produce as much electricity”. “In a subsidy-free world, we will always be a low cost producer, even when transmission costs are factored in”, he commented regarding the significant competitive advantage of Tunisian solar energy production. According to Daniel Rich, the project is expected to stimulate more than $5 billion of investment in Tunisia, and it will create more than 20,000 direct and indirect jobs. TuNur Ltd constitutes a private company incorporated in the UK, whose principal shareholders are London-based solar power developer Nur Energie and Tunisian and Maltese investors. A similar attempt had been realised some years ago, under the famous project Desertec- an initiative led by German investors to export huge amounts of solar from Tunisia to Europe. The bold initiative had then been abandoned, with one of the reasons having been the political instability in the Middle East and Northern Africa (MENA) regions. The National reports that similar dangers still lie- one indicative example is the wide grid and border disputes between Algeria and Morocco over the Western Sahara.